Warner Bros. announced today that they will be re-releasing cinema classic The Wizard of Oz into select IMAX theaters on September 20. The re-release is slated to have a one-week stint where you can see the film on not only the giant silver screen, but also in 3D. On the surface, this could have been a really awesome experience. 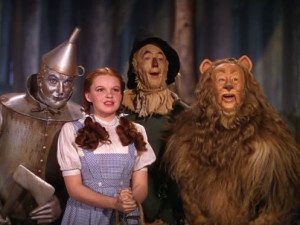 Who wouldn’t want to see The Wizard of Oz in IMAX? The conversions that IMAX has done for classic films were quite remarkable, notably Raiders of the Lost Ark. However Warner Bros felt the need to do a 3D conversion of a film that was originally released in 1939. Does this spell trouble? Only time will tell. The Titanic re-release looked pretty awesome on the IMAX screen, but the 3D really didn’t add anything to the experience. I’m sure the people in charge of the post-conversion process are taking great care with film, but I can’t help but think it’s impossible make anything worthwhile in 3D using the post-production process, let alone with a film that was made so long ago. Do you want to take another trip down the Yellow Brick Road? Do you care if that trip is in 3d? Let us know in the comments if you’re excited.